The Centre Block of Parliament Hill stands out as one of the most impressive examples of neo-Gothic architecture in Canada. While attending a presentation there earlier this year, I walked along the Rotunda and admired the ornate grandeur and vivid detail of the masonry and continued into the Hall of Honour, which leads to the Library of Parliament. 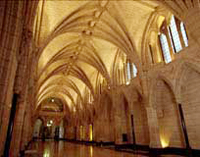 The elegant vaulted ceilings of the Hall of Honour resemble old Medieval cathedrals; as I gazed up transfixed by the beauty of the arches and keystones, I considered the entire structure “hallowed ground”. Parliament as an institution refers both to the physical structure – the parliamentary precinct itself – but also to the idea of parliamentarism as a form of government. The dignified neo-Gothic architecture, thoroughly steeped in history, illustrates the “ancient tradition of ordered liberty” and captures the Christian origins of Westminster parliamentarism far more effectively than any other architectural style. The Gothic Revival during the Victorian era also corresponds to a rejection of republican radicalism and a repudiation of the French Revolution, with which the neo-classical architecture (wrongly, in my view) had become associated. I also admire neo-classical architecture, which the Capitol Building and the Parliament of New Zealand exemplify, but it lacks the magic of neo-Gothicism. 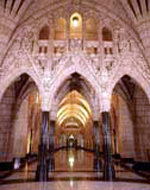 Even though the current Centre Block of the Parliament of Canada dates to only 1927, the neo-Gothic style effectively maintains the illusion that Centre Block is as old as the institution of parliament itself. Parliament originated in the Middle Ages – the Christian Age – so naturally it derived important ideas from Christianity. Some scholars have interpreted the tripartite Crown-in-Parliament as the expression of the humanist ideal of a balanced constitution or the institutional embodiment of the “three estates”: the Queen (monarchy), the Senate (aristocracy), and the House of Commons (democracy). Canadian historian William D. Gairdner interpreted the tri-partite Crown-in-Parliament as the institutional representation of “the classical and deeply Christian image of the human being,” which consists of the “Sprit (monarchy), Mind (Senate), and Body (House of Commons).” Perhaps one could also think of the Crown-in-Parliament as the parliamentary equivalent of the Holy Trinity. The Crown-in-Parliament has evolved away from the strictly Christian (and later, exclusively Protestant) foundation and accommodates persons of all faiths, as well as those without faith – particularly in the Commonwealth realms like Canada that do not recognize any faith or sect as an official state religion. The Coat of Arms of the Dominion of Canada for an old illustrated atlas. John A. Macdonald first sought to name the result of Confederation “The Kingdom of Canada”, but the British Foreign Secretary vetoed the proposal, fearing that such a name would invite hostility from the American republic. At the London Conference, the Fathers of Confederation and the British government needed to agree on a new name. In the King James version of the Holy Bible, Psalm 72: 8 reads: “And he shall have dominion also from sea to sea, from the rivers unto the ends of the earth.” This passage probably influenced the original choice of name of this country, “The Dominion of Canada.” Canadian historian A.H.U. Colquhoun considers the biblical origins of the “Dominion of Canada” apocryphal (pun intended). The Department of Canadian Heritage acknowledges that the national motto contained in our coat of arms, Ad mari usque ad mare (“From Sea to Sea”), comes from Psalm 72:8. The ribbon of our coat of arms contains the phrase desiderantes meliorem patriam (“desiring a better country”), which comes from Hebrews 11:16. Given that our national motto comes from Psalm 72:8 and that this same passage also discusses “dominion”, I wouldn’t be surprised if the framers derived the idea of the Dominion of Canada from the Bible as well. Parenthetically, I have only determined that the “Dominion of Canada” fell out of use sometime under Prime Ministers Pearson or Trudeau, though the patriation in 1982 and Parliament’s elimination of “Dominion Day” with “Canada Day” the same year certainly marks its final end. Paul Benoit, “The Crown and the Constitution,” Canadian Parliamentary Review 25, no. 2 (2002): 2-3. Janet Ajzenstat et al., ed. Canada’s Founding Debates. (Toronto: University of Toronto Press, 1999): 83. This entry was posted in Parliament, Traditions and History and tagged Dominion of Canada, Janet Ajzenstat, John A. Macdonald, Kingdom of Canada, Paul Benoit, Psalm 72:8, William D. Gairdner. Bookmark the permalink. James, I confess I have a number of problems with this post, though I certainly agree that the Centre Block is a jewel. My first comment is that I think Parliament is about as Christian as the Christmas tree and December 25. The roots run much deeper. And talking about the Trinity and the tripartite human being (shades of Freud’s superego, ego and id!) is just mythologizing Parliament. But then I’m no authority on political anthropology so I can’t say for sure whether any of these ideas actually guided the thinking of, say, Simon de Montfort or others–as opposed to being superimposed on events by later myth-makers. That leads me to “dominion” and our national motto. Psalm 72:8 (King James Version) does use the word “dominion”: “He shall have dominion also from sea to sea (viz. Red Sea and Mediteranean) …”. “Dominion” in the same sense is also found in Psalm 49:14 and in Romans 6:9. Note: “in the same sense”. The sense of “dominion” as used in these passages is not the sense of the word “dominion” as used in the Constitution Act, 1867, or in the designation “Dominion of Canada”. In the Bible passages, “dominion” means supreme authority, sovereignty, control. That meaning is still found in “Arms of Dominion”. Not the same meaning as in the 1867 Act and other Canadian political documents. In those, the meaning of “dominion” is a domain or territorial possession of a ruler. Of course, the ruler may be said to have dominion (Biblical sense) over that domain or territory. So closely related senses, but not identical. Tilley, often credited with proposing the use of “dominion” in the 1867 Act (which nowhere says “Dominion of Canada”; it uses “Canada” alone), was surely familier with the short-lived Dominion of New England (1668) and the sobriquet given to Virginia (“Old Dominion”) around 1660. Of course, “dominion” was also used before that time to refer to the monarch’s various lands. So it was the perfect word to use in the 1867 Act after “kingdom” had been vetoed by the British. But it wasn’t used in the Biblical sense, though related to that sense. Finally, the motto “From Sea to Sea” was proposed by Sir Joseph Pope, Under Secretary of State for External Affairs, in the design of the Arms of Canada approved by King George V in 1921. So I think Tilley’s role has been exagerated and mythologized. I was discussing the implications of “Dominion” with a friend yesterday. 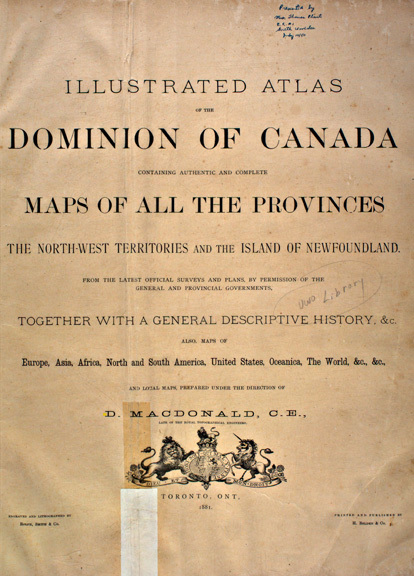 I recognize that “Dominion” originally referred to the domain of the Crown of the United Kingdom; however, I also suggested that after the enactment of the Statute of Westminster and the creation of the Crown of Canada, we could and should have transferred the concept of dominion from the British Crown to the Canadian Crown and transformed the nature of the term from colonialism to Canada’s command over its fair domain. In other words, we could have invoked Dominion as an example of our independence instead of continuing to look upon it as a symbol of colonial subordination. I had about Joseph Pope’s role in mythologizing “From Sea to Sea” in the 1920s. However, the Fathers of Confederation themselves — particularly the Presbyterians like George Brown– did references on several occasions this “manifest destiny”, if you will, of Canada’s inevitable progress and expansion toward the Pacific. Brown talked of annexing “the Saskatchewan”, which of course we did in the early 1870s through a British Order-in-Council. I have also been developing an idea that a sense of “Canadian exceptionalism”, derived from Canada’s place within the British Empire, motivated our leaders in the first 50 years or so toward westward expansion and settlement, as well as Laurier’s inaccurate prediction that the 20th century would belong to Canada. I would also argue that regardless of whether British and Canadian officials acknowledged the biblical origin of “Dominion” openly and consciously or not, this Latin neologism and the concept underpinning it most certainly did come directly from the King James translation of the Bible and provided, perhaps unconsciously, the inspiration for the “Dominion of Canada.” The control by the Crown (which is itself steeped in medieval Christian notions of the Great Chain of Being, etc.) over these colonies also invokes — again, whether consciously or unconsciously — the original biblical meaning that you identified above. Just a note to say “dominion” came into English via French “dominion” (not found in Modern French except as borrowing from English to refer to British dominions!) and not directly from Latin. Love how words circulate between English and French. Regarding keeping “dominion” with further modernization: coulda (yes), shouda (? ), didn’t (it’s now dead).